Our in-house design team can help you create one-of-a-kind freestanding furniture that will surprise and delight your clients. Have a vision? We can help make it a reality. Build a design legacy with our handcrafted furniture. From handcrafted cabinetry and sublime custom paneling to intricate multi-layered butler doors, we see your vision through completion. Our master craftsmen serve as part of your extended team to take your design to the next level. Over thirty years ago, Richard (Rick) Hulme and Daryl Evans took a cross-country motorcycle trip that would change their path for years to come. They both spent their days honing their crafts. Daryl, the engineer and builder behind innovative designs. Rick, the artist, and creator of high-end finishes. 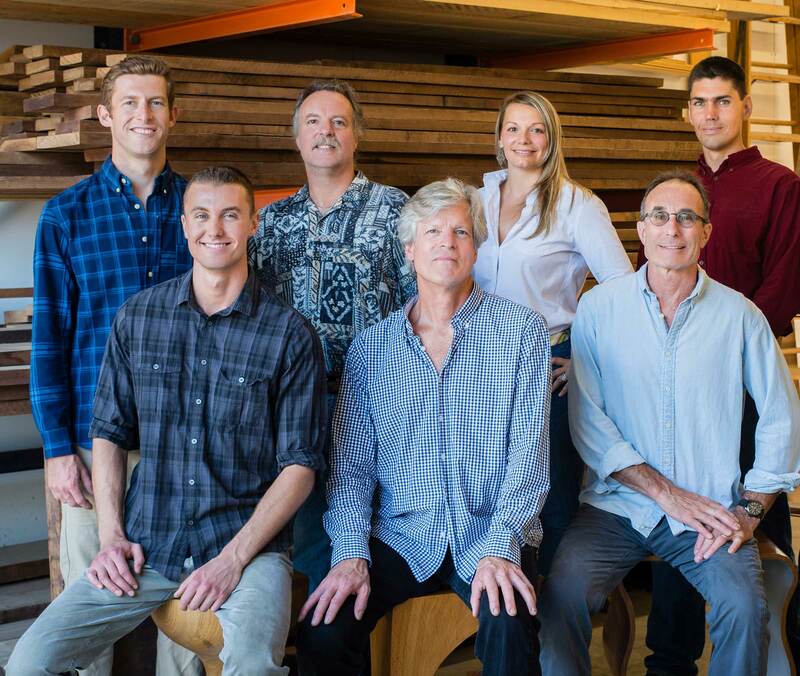 Together, they crafted a company that still thrives thirty-six years later. Graduating from Framingham with honors in Industrial Arts, Daryl gained an apprenticeship with master craftsman Mario Genevese in South Natick, MA building custom furniture. Several years of intense training with Mario led to employment with fine furniture maker Richard Monaco. Daryl works with our creative team on the build components of each job. He’s a measure twice, cut once kind of guy and ensures quality every step of the creative process. A visit to a woodworking shop at the age of nine became the inspiration that would set the course for Rick’s career. After attending the University of Maine, Rick also took an apprenticeship with master craftsman Mario Genevese. Along the way, Rick’s path turned to the art of finishing. Rick’s love and appreciation of art, combined with his fine finishing skills, has cultivated a unique talent that sets his craft apart from all others. While attending the University of Connecticut majoring in Political Science, Rob worked in residential construction while earning his degree. Rob then went to work for General Dynamics, building complex submarines. Following his future wife to Chicago, Rob was employed by Neidermyer, designing and constructing high-end retail display. Upon returning to New England, Rob worked with a custom mill shop on Martha’s Vineyard producing detailed yacht interiors before joining the Masterpiece team in 1998. Rob’s attention to fine detail and strong experience with 18th-century reproduction furniture has enabled him to draw on these exceptional skills, leading him to be a valuable asset to the studio for the past fifteen years. An award-winning designer and a graduate of Boston Architectural College with a degree in Interior Design, Beth has been designing residential and commercial interiors for over a decade. Prior to joining the Masterpiece team in the spring of 2012, Beth worked at two Boston area design firms before becoming an associate designer at SBG Architects, Inc. in 2006. In early 2012 Beth launched her own interiors studio, where she spends her time away from Masterpiece. With a strong background in architectural interiors, Beth brings her design skills to the table. Teaming with the client, she oversees all production phases from the initial schematics through completion, streamlining the design process. From building models as a boy, to chip carving as a teen, George has always had a passion for detailed woodworking. After completing a Liberal Arts degree at Thomas Aquinas College, he furthered his skills at Furniture by Dovetail, crafting furniture and built-ins predominantly in a contemporary Shaker style. George later became the lead finish carpenter for a residential contracting company, supervising high-end remodeling and new construction which involved detailed wainscoting, molding, and joinery. A recent addition to the Masterpiece team as a cabinetmaker, George is thrilled to be back in the world of furniture, where he especially enjoys working with varied species of wood with beautiful grain. George’s careful handiwork and eye for precise detail are a perfect fit with the vision behind the Masterpiece mission. The youngest member of the Masterpiece team, Sam spent summers working at the shop getting his feet wet. His other “paying” job was working at a local farm which inspired him to earn a bachelor’s degree in environmental conservation at UMass Amherst. An avid music fan and guitar player, Sam developed a fondness for playing challenging heavy metal music. After graduation, the idea of building his own guitar someday steered him back to the craft of woodworking. Now at Masterpiece full-time, Sam is honing his skills in the furniture trade. A candidate for her Bachelor’s Degree in Interior Design & Architecture from Mt Ida College, Laura has been working in the design field since 2015. Prior to, Laura graduated with honors from Silver Lake Regional High School in 2015 where she was the captain of her high school basketball team. Laura’s attention to detail and quickness in technical drafting and design skills have made her an asset to the Masterpiece office. Laura’s passion for animals also leads her to the Design New England Showdown finals in 2018 where she is featured for designing an impressive dog shelter. Enjoying working with the design trade, Laura is quickly expanding her design portfolio. When not at school or at Masterpiece, Laura enjoys spending time with her family and her three dogs. Laura hopes to one day to also design and build a home of her own. Nils is a designer and maker of fine furniture who got his start with a classical education in traditional furniture making. He graduated from North Bennet Street School in Boston, MA from the Cabinet and Furniture Making program. North Bennet Street School is widely regarded as one of the premier woodworking schools in the United States with a reputation for excellence and upholding the traditions of fine craftsmanship. While living in New York after graduating, Nils worked as the Lead Fabricator for renowned luxury furniture studio, John Fischer Furniture, completing custom design-build solutions and one-off furniture pieces for New York’s top architects and designers. Our handcrafted furniture and bespoke interiors are favorites of designers throughout the Boston area. Make a statement with a Masterpiece.